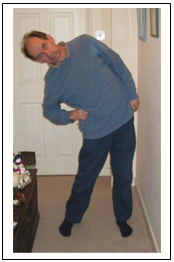 To achieve looseness it is vital to have a sequence of stretching exercises, which are done every day. My selected sequence takes less than two minutes per day and will avoid a multitude of problems and maintain looseness in most of the important muscles. I personally do my daily stretches immediately before going to bed but the timing doesn't matter. This is my daily sequence. I suggest keeping to this order and simply making it a daily habit. Each stretch is 10 seconds. There is nothing particularly significant in this. It is simply a reasonable minimum time, which keeps the total below the two minutes. Stretch 1. Shoulder stretch -- mainly for pectorals. 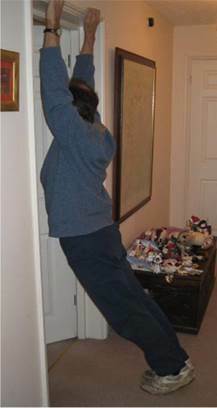 "Hanging from doorway"
Simply hook your fingers on the door frame and lean forwards. This should feel tight from the chest through the front of the underarm area and into the top of the shoulder. It may feel tight elsewhere -- doesn't really matter. 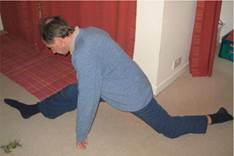 10 seconds of this stretch every day for the rest of your life will avoid a multitude of shoulder problems and help the looseness of the whole of the shoulder area. You are not taking the whole of the bodyweight on the arms, the feet are certainly on the ground but there should be quite a lot of vertical tension in the arms. Stretch 2. Biceps stretch. 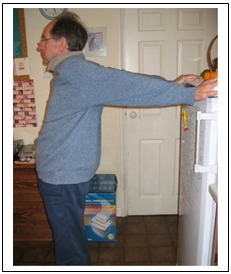 "Palms on the fridge or filing cabinet"
Simply place your palms behind you on top of a fridge or other cabinet. Walk a bit away from the cabinet to increase the tension in the biceps. Not much tension is required for a reasonable 10 second stretch. The biceps crosses both the shoulder joint and the elbow so this is the only way to stretch it. The biceps does a lot of continuous work in our lifestyle and develops sensitive points of bad circulation. It deserves a bit of stretching daily to allow the circulation to improve. Stretch 3. Wrist flexors. "Palms on table"
Most of the muscles which control the fingers are in the forearm. We use these all day and every day and can develop a multitude of problems including those referred to as RSI. Daily stretches of wrist flexors and extensors are important. Simply stand close to kitchen table or desk, place both palms on the surface, fingers pointing away from each other, wrists fairly close to one another and hold for 10 seconds. This stretch is done one arm at a time. Arm vertical, back of hand on the table (nicer if the surface is soft -- try a chair). Make a good right angle at the wrist. Then we use the fingers of the other hand under the knuckles to increase the wrist angle and the palm of the other hand to push the fingers towards the vertical increasing the stretch in the wrist extensors and in the wrist itself. Stretch 5. Abdominals. "Slow hip swing"
Stand feet apart: left hand on waist. Lean forward and left while pushing the top of the pelvis to the right with your left hand. This should stretch the right kidney area (the quadratus lumborum muscle actually). Now rotate the area of stretch so that it is the right side and then rotate it further so that the area of stretch is the right side of the front of the abdomen and so on until you have done an almost complete circle finishing with a stretch of the left kidney area. Whenever anything feels tight just stop at that point for a few seconds to give an extra stretch to the tight point and thereby loosen it. Don't lean straight forwards. This is not meant to be a stretch for the spine or back muscles. Stretch 6. Hip joint mobility. "Left right left right"
Hip joint mobility is of immense importance and the natural level of mobility is always lost in our lifestyle unless we take the trouble to maintain it. Most people are hopelessly tight in hamstrings and other hip muscles. My sequence of hip joint stretches is intended to maintain the mobility without using the spine as a lever to achieve this. Most other hamstring stretches achieve an undesirable stretch in the lowest lumbar joints without putting much tension on the hamstrings. There are two main muscle groups which limit the hip joint mobility. There are the hamstrings on the back of the thigh, which cross the knee, and the adductors on the inside of the thigh, which do not cross the knee. These can be stretched separately and we can also stretch one leg at a time to get the most effective stretch of these very strong muscles. 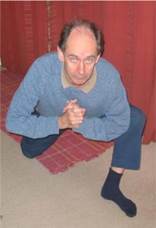 Kneel on the right knee with the left foot in front of you and the left knee bent through 90°. Use the left elbow to push the left knee outwards to the left. This will stretch the left adductors. Extra force can be achieved by using the right hand against the left hand. Next stretch the right adductors by reversing the sequence. To stretch the hamstrings of the left leg, kneel on the right knee and slide the left heel forwards as far as you can with the knee fairly close to straight. This will be opening out "the splits" and is best done without shoes. Now we lean forwards slightly to increase the tension in the left hamstring. Now reverse the sequence to stretch the right hamstring. That is the end of my daily sequence of stretches. You will see that it concentrates mainly on the connections of the limbs to the body. There is no need for a separate stretch for the spine because slumped sitting achieves all the stretch that the spinal muscles require and is totally natural. Slumped sitting also has the great advantage that it requires no time at all on a daily basis so long as you get into the habit of sitting on the ground occasionally maybe to watch a bit of television in the evening.